It’s crucial that young ones continue their education after traumatic events disrupt their lives. One way we ensure children are in a fit state to continue their education after Tropical Cyclone Winston is by training teachers to recognise and address signs of psychological distress. 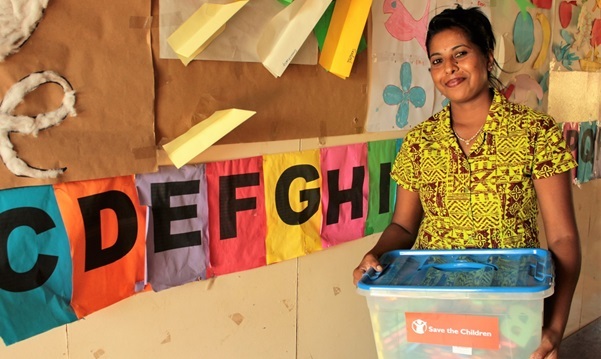 Save the Children has given Psychological First Aid (PFA) trainings to a 290 teachers and carers in regions badly affected by Tropical Cyclone Winston, who in turn have been able to provide guidance and support to children who were not coping with the trauma of the cyclone. After a natural disaster there are a number of risks to children. First there is the physical risk, with damage and debris strewn across villages, children often do not have a safe space to play. There is also of course the psychological risk, as many children were witness to distressing scenes around the country. Following the cyclone, Save the Children quickly established and staffed Child Friendly Spaces, a physical space where children could safely play, and interact with peers, and start talking about some of the things they may have witnessed. We trained Child Friendly Staff on how to identify children experiencing difficulties coping with the trauma of the cyclone, and provided them with kits comprising of puzzles and toys for the children. Child Friendly Spaces also served as a place where parents could safely leave their children supervised, giving them the time needed to begin rebuilding their lives.